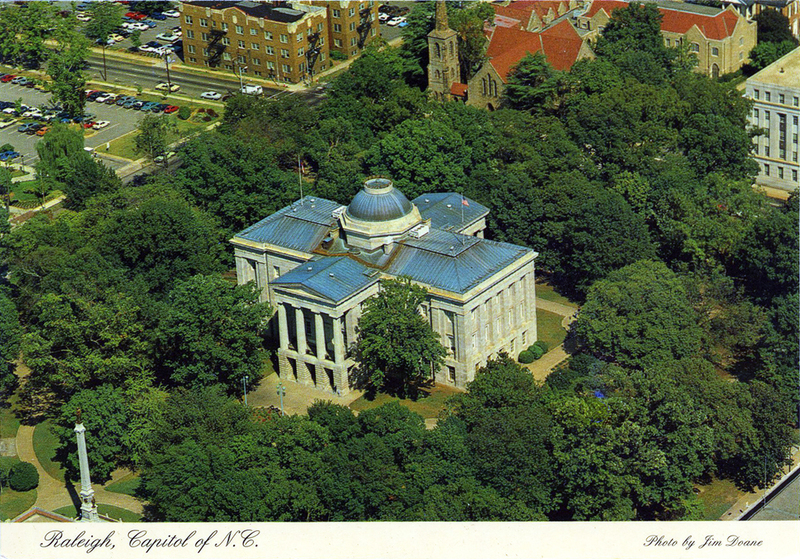 This week Flashback Friday soars high above Raleigh’s beloved State Capitol. The sophisticated 19th century Greek Revival building has stood on this spot for 175 years. We’ll also take a peek at the history of this building and its predecessors. So climb aboard and enjoy the flight! The State Capitol, started in 1833 and finished in 1840, replaces the first state house which burned in 1831. Originally this building housed all of N.C.’s state government. As the state grew, new buildings were built around Capitol Square; the State Dept. building, etc. The new legislative Building is located one block north of the capitol. One may view statues of three presidents North Carolina gave to the nation from the East Grounds. This 1925 view of Capitol Square is similar to that seen in this week’s photochrome postcard. Many of the buildings seen here are long gone, but some still stand today. How many do you recognize? 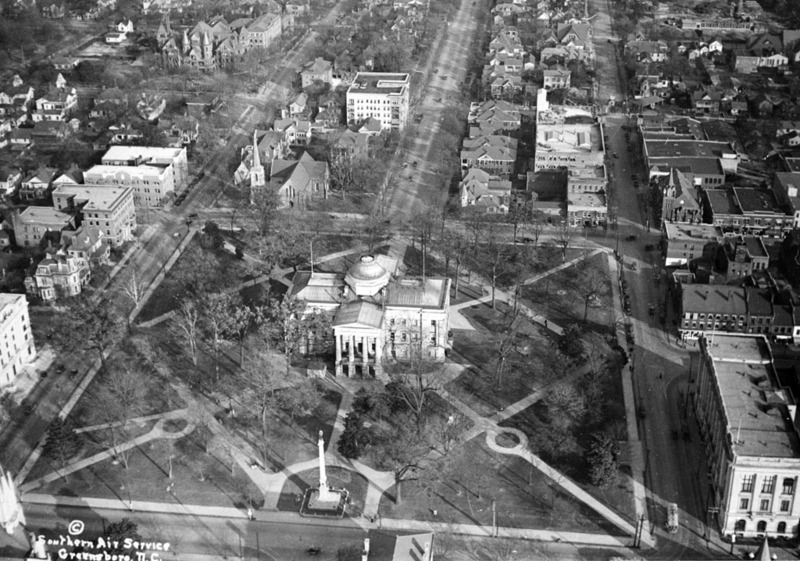 This 1925 aerial photo shows the arrangement of Capitol Square as it appeared in the early 20th century. The current landscaping dates to 1928. Raleigh was a planned 18th century urban environment, much like Savannah, Washington, DC, and Philadelphia. In Raleigh’s grid plan, four radial avenues extended from a central public space — Capitol Square, or more formally, Union Square. The first capitol building, or state house, was erected on the six-acre square in 1795. 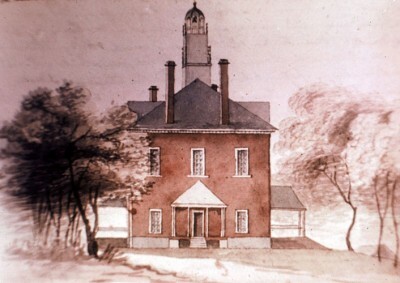 The Federal style, two-story brick building featured modest porticoes and a tall cupola. This ca. 1800 water color painting depicts North Carolina’s first State House, as seen from Fayetteville Street. 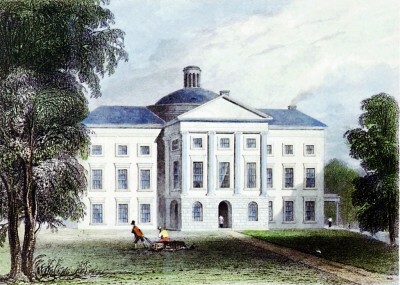 In 1818 the General Assembly engaged William Nichols as State Architect. His primary task was to refurbish and enlarge the old State House. Nichols raised the building to three stories, added classical porticoes to the east and west facades, created a central rotunda, and topped it all off with a copper dome. Work began in 1820 and was completed in 1822. The result was a graceful, neoclassical Capitol building. This 1830s lithograph depicts Nichols’ masterful transformation of the 1795 State House into a stately 19th century neoclassical Capitol. Sadly, Nichols’ masterpiece was destroyed by fire in 1831, and, ironically, the cause? — negligence. Workmen replacing the wood shingle roof with ‘fireproof’ zinc plates left a soldering pot unattended, the roof caught fire, and the building burned to the ground. In the aftermath, debate ensued in the General Assembly to move the seat of government elsewhere. The Raleigh faction prevailed, and the decision was made to keep Raleigh as the state’s capital. The firm of Ithiel Town and Alexander Jackson Davis of New York was retained to design a new capitol building. Scotsman David Paton was the supervising architect. This ca. 1840 lithograph depicts North Carolina’s State Capitol as it appeared soon after its completion. The cornerstone was laid on July 4, 1833, and in the spring of 1840 the building was completed. 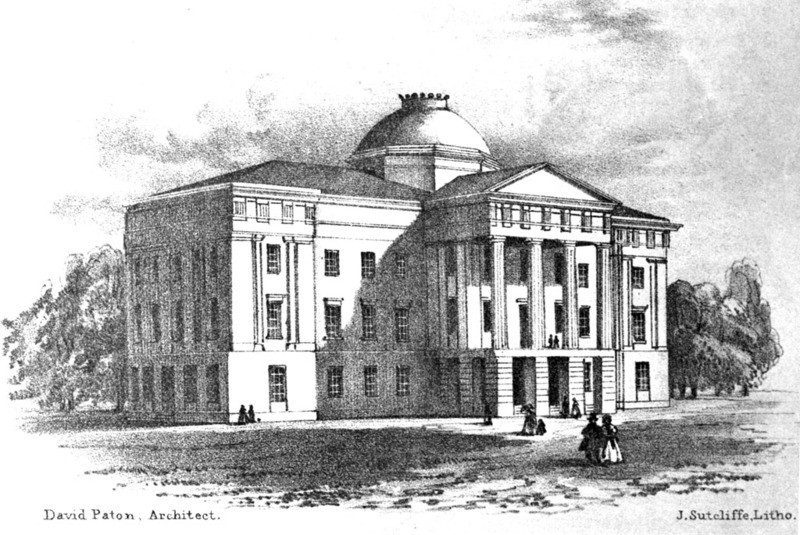 The new Capitol was of textbook Greek Revival design, favored as a representation of public buildings of the era. It was cruciform in plan, featured a central rotunda, and was crowned by a copper dome. 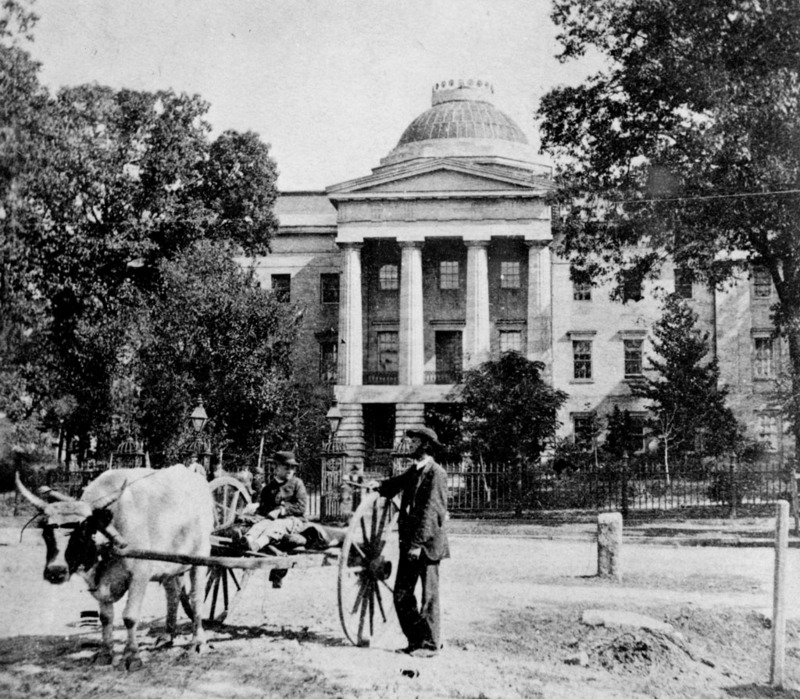 Capitol Square with its canopy of ancient oaks enhanced the building’s appearance of permanence, formality and importance. This rare ambrotype of the Capitol shows the building and grounds ca. 1861. This view of the Capitol’s western facade dates to the 1880s. 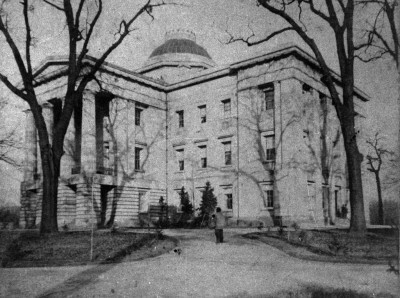 Our Capitol Building, a North Carolina architectural gem, and treasured Raleigh landmark, has undergone many renovations and restorations over the decades, but the noble structure itself looks virtually the same as it did in 1840; and still reigns supreme over Capitol Square, in the heart of downtown Raleigh. Our North Carolina State Capitol has been designated a Raleigh Historic Landmark, and is on the National Register of Historic Places. Our Flashback Friday photochrome postcard this week was published by Aerial Photography Services of Charlotte. It was printed by Dexter Press, Inc. of West Nyack, NY. Printer of a wide variety of postcards subjects as linens and photochromes. Thomas A. Dexter was the inventor of gang printing. The Company merged with MWM Color Press in 1980 to become MWM Dexter, and they moved to Aurora, MO. While all the photochromes printed by Dexter bore the words Genuine Natural Color they went through a variety of phases. Their early photochromes went under the name Dextone and tended to be flat and somewhat dull in appearance. As years went by their optical blending techniques improved producing richer and more varied colors. This building was plainly in view every Sunday as we arrived at church – Good Shepard. Often after church we would stroll through the grounds. It sort of felt like home! First Baptist on Wilmington, First Baptist on Salisbury, First Presbyterian.